West Indies cricket team is currently travelling New Zealand due to play a dual series against New Zealand. Considering the schedule, their competition has started with long format matches. First match was started in 1st December, 2017 where New Zealand beat Windies by an innings and 67 runs. 2nd match was started in 9th December, 2017 where New Zealand won by 240 runs. 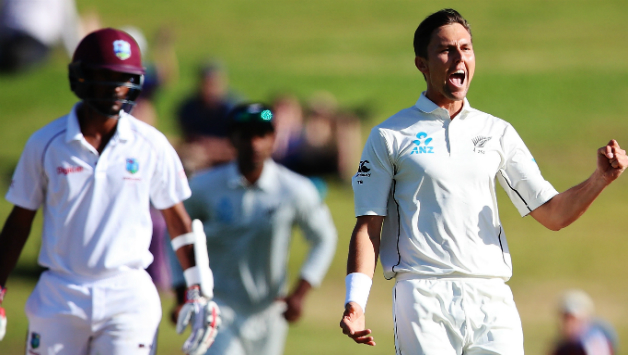 The series consists of two matches and so, New Zealand won Test series against Windies. The match consisted of five days where West Indies won the toss and decided to bowl first. Kraigg Brathwaite was playing the captain role in the match and became the 37th captain of West Indies in Test cricket. For Windies, Raymon Reifer made his Test debut. New Zealand scored 372 runs and lost all wickets by batting first. Their top scorer was Jeet Raval who scored 84 runs so far. Shannon Gabriel took highest four wickets for Windies. On the other hand, West Indies got packet in 221 runs. They played just 66.5 overs. Skipper Kraigg Brathwaite scored highest 66 runs for the team. Trent Boult took four wickets for Black Caps. However, came to bat in second innings, New Zealand scored 291 runs by losing eight wickets. Then they declared the innings. They played 77.4 overs totally in 2nd innings. Ross Taylor scored a brilliant century out there. He scored 107 runs. Miguel Cummins took three wickets for visitors. Now, Black Caps presented a fixed target in front of Windies but they lost all wickets in 203 runs and faced another big defeat. Finally after the second innings declaration New Zealand presented 443 runs target in front of West Indies team. So, it seemed a big target even for Windies. They started their second innings with skipper Brathwaite and Powell. In just four runs, Powell was gone. He did not score in the innings. Later, Hetmyer came up but was gone so early as well. He scored 15 runs so far. Basically, within regular gap West Indies used to lose wickets. Just Chase played a bit well who scored 64 runs highest. New player Reifer also played well and scored 29 runs. They needed to build a strong partnership but could not do so. Roach scored 32 runs. Players got few runs with bat where they needed large score. So, in 63.5 overs Windies lost all wickets. They scored just 203 runs and so, they were defeated by 240 runs. Wagner took three wickets where Southee, Boult and Santner took two wickets each.